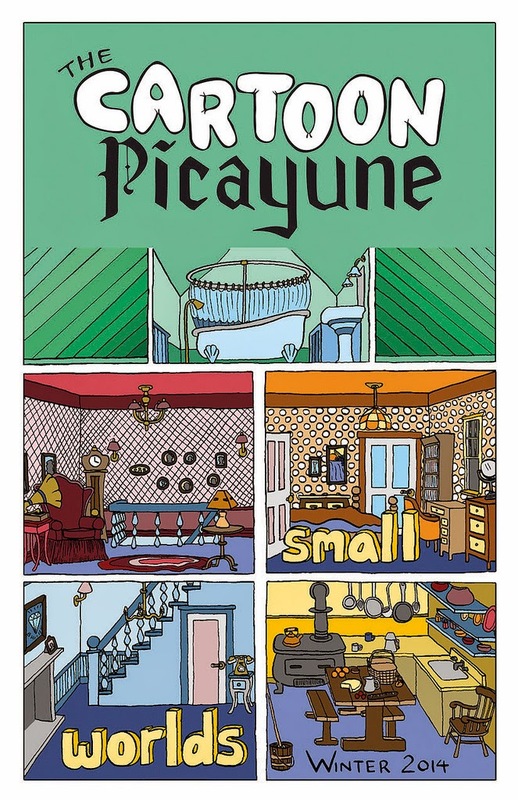 The Cartoon Picayune #6, edited by Josh Kramer. The theme in this post about CCS cartoonists is "comics reportage". A slowly but steadily growing arm of comics, CCS has Dan Archer out in the field, doing some innovative and daring reporting. Kramer was the next adherent, and each issue of his reportage magazine The Cartoon Picayune has looked progressively more confident. 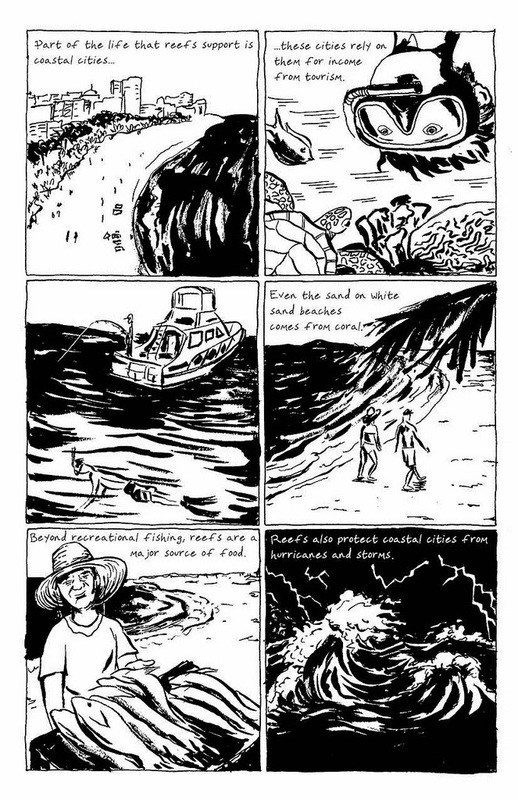 This issue's theme is "Small World", and it's highlighted by "Reef", a story by cartoonist/ecologist Adrian Pijoan. It's certainly the best story I've seen from this former student of the Sequential Artists Workshop, as it goes into great detail regarding the microbiology of reefs and how climate change has had a direct impact on the death of reefs. Pijoan talks about the biology of the reef and its symbiotic relationship with microorganisms that give them color and cause them to become thriving ecosystems. These ecosystems, in turn, protect cities from storms and attract fish for harvesting. Pijoan has greatly simplified his drawing technique, allowing for the stark simplicity of his black and white drawings to jump out at the reader. He also expertly unloads a lot of information on the reader while making each page interesting to look at with a related narrative. Bill Volk's "Fernando And The Furries" is about that particular geek/fetish group, but it focuses on something other than the specifics of their interest. It's really about a sandwich shop owner who catered to a Furry convention and later went out on the street to try to protect a couple of Furries from a random street harasser. After he got hurt for his troubles, the Furry community rallied around him in gratitude, and later sent him money when his shop was failing. The real thrust of the article is the way in subgroups can use their collective influence for good, especially when an otherwise persecuted or misunderstood group is made to feel respected or simply human by a "civilian". At a time when the cruelty and bullying behavior of now-culturally ascendant geeks is dominating cultural discourse, Volk captures a heartening and kind anecdote. 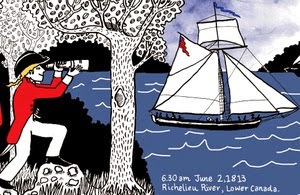 Other stories include JTW bringing light to the works of Henry Darger and Jackie Roche talking about how Robert Todd Lincoln (President Lincoln's son) was saved by the famous actor, Edwin Booth (the brother of assassin John Wilkes Booth). The former story is compelling but suffers for the lack of color that made Darger's work come to life. The latter uses greyscaling to provide an appropriately gloomy atmosphere regarding the relationship between the Lincolns and the Booths and add an inspiring capper to that history. Roche has a knack for capturing the likenesses of key historical figures in a dynamic manner that allows them to breathe on the page as part of the story rather than just stand still in an inert manner. It's the difference between cartooning and illustration. The Battle of Lake Champlain, The Best Beer In The World, and Counting Turtles: Field Notes, by Eleri Mai Harris. A native of Tasmania, Harris works around her limited drawing skills with a spectacular use of color, impressive research skills and storytelling instincts that transform history and journalism into compelling narratives. Counting Turtles Field Notes is about a volunteer scientific group that tags turtles in a Florida preserve to monitor their activity over time. 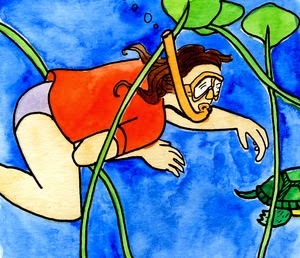 The cheerily-colored comic (almost a bit too cheery in some spots for a Florida swamp) is as much about the thrill of the chase in trying to chase down water turtles as it is about science, conservatation and the biological aspects of ecology. The time that Harris spent with this group is obvious, making this an oral history document experienced in the flesh. The Best Beer In The World is very much in this vein as well, as she interviewed a husband-wife brewing team in Vermont. It actually turned out to be quite an exciting story, encompassing the impact of a hurricane that led to massive flooding in Vermont and the destruction of their brewpub. The story is about innovation, simplicity and the ways in which scarcity can lead to an almost fetishistic desire to possess something. Visually, it's a stunner. The different colors Harris uses for both story and narrative captions are a simple matter of choice, but they make text and image pop out on every page. The story would greatly suffer without them. Harris' best comic is The Battle of Lake Champlain. It's a detailed story of the naval battle that essentially decided the postwar borders of the War of 1812, fought between the USA and Britain. She uses that simple line of hers and mixes it with the red of Britain and the blue of America (she notes that the colors aren't entirely historically accurate, but she did it for the sake of clarity) to create an absolutely gripping account of espionage, sabotage, naval engineering feats, military strategy, military culture and how the vagaries of nature can turn a battle instantly. Using a great deal of primary resources like letters and other direct communication, Harris brings an immediacy to the battle missing in most historical accounts of war that rely solely on the tactics and outcomes of a battle. Injecting it with humanity on both sides makes the subsequent US honoring of their vanquished foes all the more understandable. Without a doubt, this is one of the best minicomics I read in 2014; it's a perfect blend of style and substance. 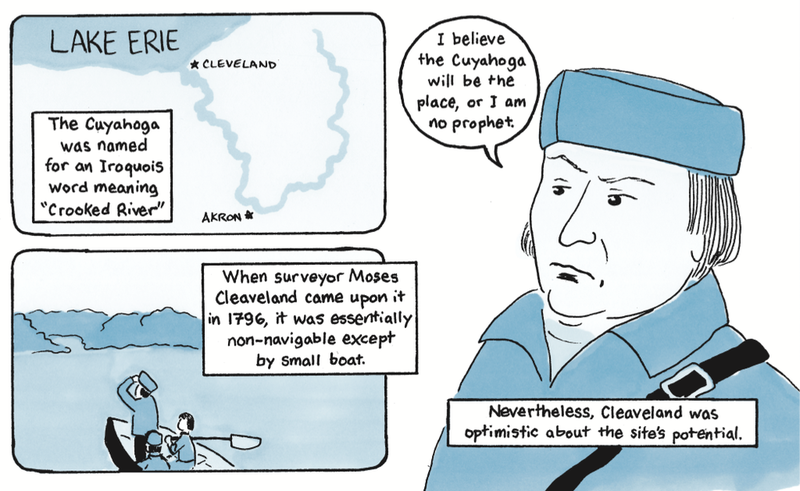 The Crooked Cuyahoga, by Bryn Adams. This second-year student (class of 2015) has a style similar to that of Harris or Kramer. The actual drawings are simple, slightly wobbly and on the cartoony side. However, this landscape-formatted comic was cleverly designed and executed, and it's clear that a lot of thought went into how each page was composed. Adams takes advantage of the format with lots of shots of Cleveland's Cuyahoga river stretching across not just one page, but both pages of the landscape pages. On some pages, she lets time or space stretch out on the top half of both pages while drawing a narrative on the bottom half. Some pages are entirely taken up by maps or diagrams, while others are two-page splashes of important images, like the infamous one of the Cuyahoga catching fire in the early seventies. What I really like about this comic, and the trend established by Sacco and continued on by the journalists noted here, is the use of primary sources and oral histories. Adams interviewed Frank Samsel, who had a great deal of insight into Cleveland's history and how its river came to be so polluted. He also happened to invent a device that did much of the work of the river's clean-up, working with a crew for several years aboard his clean-up boat. The comic has broader implications in how ecology and economics interact and have frequently been at odds with each other, and how these implications play out in the life of a city. Adams is remarkably and entertainingly thorough in detailing the history of the city and its relationship with its river and status as a trading hub and then a manufacturing center, and how losing its industries only left it with the legacy of pollution. Adams' use of blue and spot blacks livens up the otherwise bland appearance of her line art, which mostly acts as a means to an end in terms of getting across information and providing the basis of her clever formatting ideas. Adams is certainly a promising comics journalist, one whom I could easily see grappling with a longer and more complicated story.